I was having a little rummage around the net today, and came across some pictures that sparked a memory for me, long since hidden away. 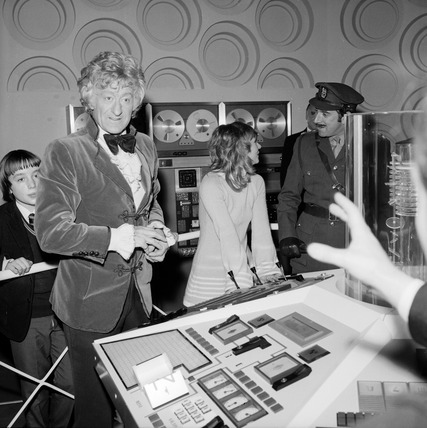 Many, many years ago – 1972 to be precise, there was an exhibition of props and costumes at the Science Museum in London. 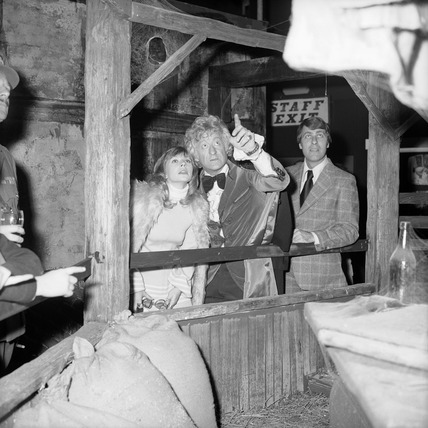 I don’t know for a fact, but I would have said this was quite possibly the first ever large public exhibition of Doctor Who props staged. Now, I have particular memory of this because it was also the first time ever I got to see any of the monsters and props up-close, having only ever seen them on the tv. I had a recollection that it was to coincide with the 10th anniversary of the programme (in 1973) but I guess my mind has good fuzzed since then. 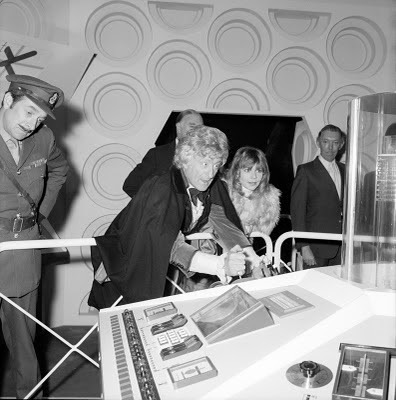 From what I recall, the entrance to the exhibition was through the TARDIS doors, and you then went on a winding path through the exhibition, seeing Daleks, Sea Devils, Draconians and the like as you went (see left). I can remember seeing the TARDIS console, which was awesome to view at close quarters (see right). One thing I did see, but never understood, was something relating to the effect on The Daemons. It was a foot cubed glass box, inside which was a miniature UNIT jeep, and something that showed how the heat barrier effect was achieved. I couldn’t work it out at the time, and looking back still can’t! Anyway, the photos I found in the net appear to be from a press day, when Jon Pertwee, Katy Manning and Nicholas Courtney (see left) in full costume. Jon appears to be wearing the Rust Red notched-collared smoking jacket with bow tie, and at one point Katy is wearing a faux fur jacket. These costume combinations were only ever seen in The Three Doctors, which was filmed in November 1972, dating these photos to around that time. Also around that day was Ian Levene who played Sargent Benton, though he wasn’t in costume like his co-stars (see right). 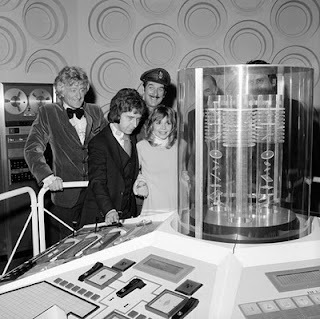 The museum (in Kensington) isn’t that far from Shepards Bush (where BBC Television Centre is located) so it is possible that the leads are in costume as they were in studio the day they visited the exhibition. 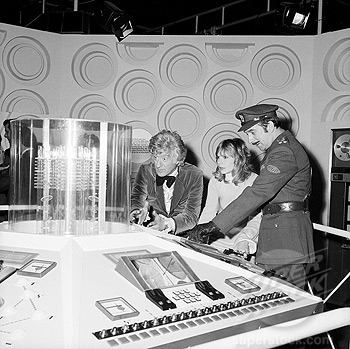 John Levene’s lack of costume could have been because he was not on call. At one point it seems some lucky school boys were roped in for some photos too (see below). 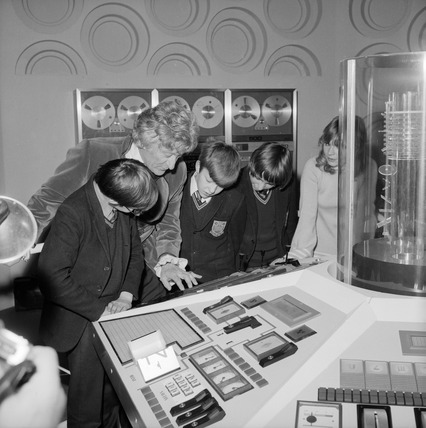 I wonder what school they were from, and if any of them are still Doctor Who fans? It’s great to see Jon in character, hamming it up for the cameras! He takes it so seriously! I saw your post regarding the Doctor Who Exhibition and particularly the 'heat barrier' effect. 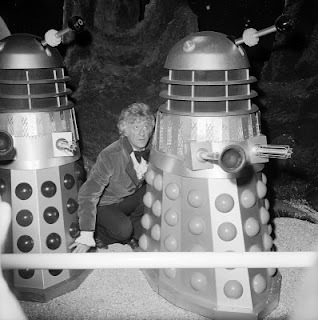 The same effect was later used in 'The Sea Devils' - when the submarine is trapped at the entrance to the underwater base. Basically (I hate that word, so don't know why I've just used it!) the effect was achieved by filming a loop of tinsel with the camera lense coated in vaseline and this was then super-imposed over the model shot. It's true what my friends say, I am a real geek!! !